Starting this June, the District will be rolling this out for all 17,000 metered parking spaces in the District, making coin-haters everywhere happy. The winner of the contract is Parkmobile, where you can register an account now, or just call in the first time you use the new technology. In addition, there will be apps for iPhones, Android phones and Blackberries, which can take some of the hard work out of it for you through GPS location. Our request for comment to DDOT went unanswered yesterday afternoon as to why they selected Parkmobile instead of the PayByPhone service from Verrus that was also in testing on K Street, I Street and near Dupont Circle. 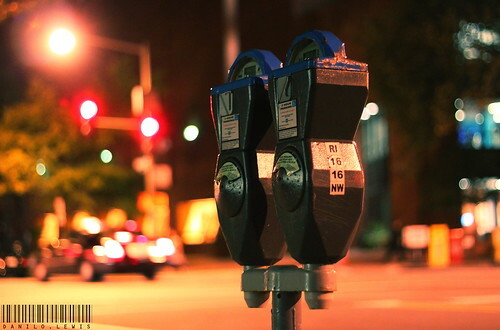 Verrus is in the process of rolling out a realtime parking availability service for San Francisco’s SFpark, which could have been a real boon for the District’s driving populace. Other Notes: A few other notes from around the transit-sphere. WIRED had a great piece last week on how mobile apps are empowering transit riders, which echoes the point I was making about Seattle’s great transportation system: The strength is in the flexibility of the system and the ways that riders can know their options. Paper timetables aren’t cutting, Metro, and the rideguide just isn’t a functional option on a mobile phone. Combining two of my loves, the Metro and Baseball, WMATA and the Nationals are trying to negotiate over who will pay for late night extensions to service in case of extra innings or rain delay or both. Currently, the city pays for late train service, which they do not do for any other sport. The Nats may find themselves a bill for $90,000 an hour, or about twice what they’re paying Ryan Zimmerman for each game this season. Speaking of which, the Parkmobile system functioned properly when I used it, but I still got a ticket from DC. Through a series of letters and phone calls between me, Parkmobile, and the city it all got straightened out, but it took awhile and wasn’t easy. Here’s to hoping that all the kinks have been or will be worked out for the full launch. I also ended up with a ticket while parked in Foggy Bottom, but it did finally get zeroed out.